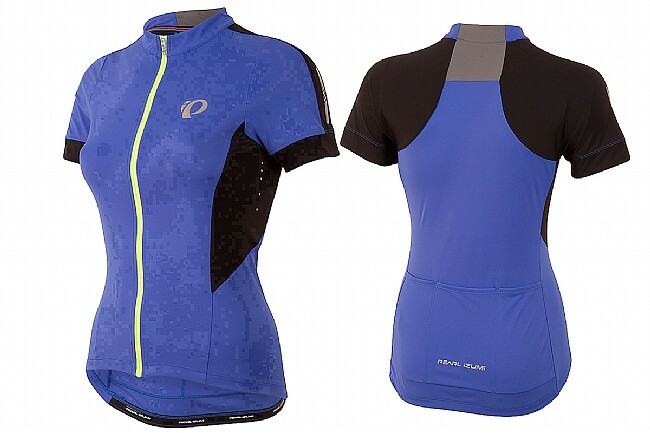 Put in hard efforts on warmer days without overheating by kitting up with the Pearl Izumi Women's ELITE Pursuit Short Sleeve Jersey. The ELITE In-R-Cool® fabric uses the thermal-blocking, xylitol-infused yarns that make up Ice-fil® technology to block out the sun and actively pull heat away from your body. A full-length zipper up front lets you control air flow, and the three standard jersey pockets out back let you stow all your usual ride goods. Features elastic gripper hem and reflective elements. Form fit. UPF 50+ sun protection. Available in multiple colors. I love Pearl Izumi's stuff usually but found that this jersey is pretty short. If I wear my mom jeans riding shorts it provides good coverage of my lower back, but anything with a lower waist band and the jersey rides up exposes my lower back. Pro The fabric is deluxe. It's very soft. I wore it for a century ride last weekend and didn't experience any discomfortchafing. Con the length on the back. It rides up or maybe it's the silicon isn't sticky enough to keep the back down. This jersey fits well and breathes . I have always been a fan of the womens Pearl Izumi kits . This jersey fits nicely , not baggy at all and the fabric definitely breathes !